Spring fever has us aflutter! Vernal pools all around are filled with frog eggs, wildflowers like spring beauties and other wildflowers are blooming, and the trees have the tiniest little leaves just bursting from their twigs. And if your eyes have been watching the skies, you’ll have noticed that many of our feathered friends are back and are scuttling about to find a place to nest for the season. 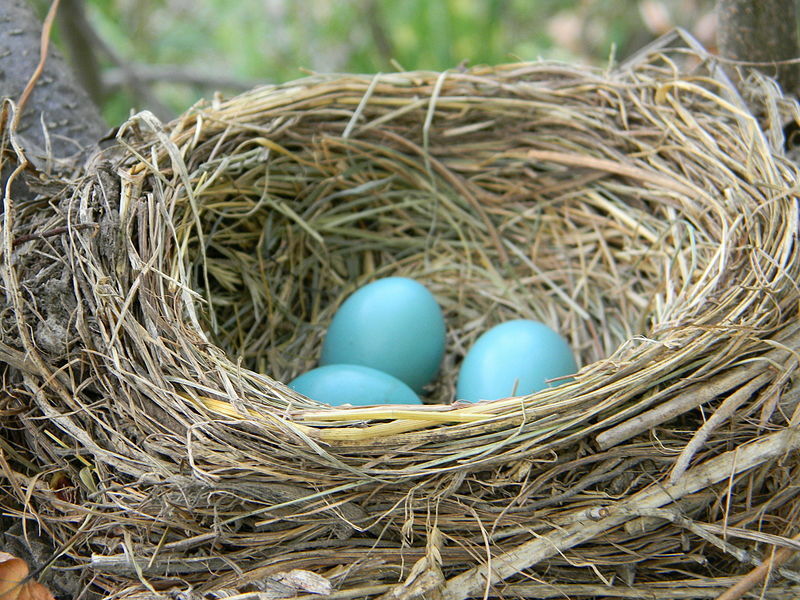 Bird nests, though quintessential to the image of “spring,” can wildly vary in shape, size, and structure. There are some birds who have adopted a nest-free approach to chick-rearing. Let’s explore the possibilities of nest types out there! Cupped Nests—These nests are built out of twigs, small sticks, grasses, and can be held together with mud. They may be built on tree branches, under the eaves of roofs, etc. These are the type most of us imagine when we heard the word “nest.” American robins are a classic example of cupped nest builders. A variation of a cupped nest can be an adherent cupped nest, like something a barn swallow would build. These birds use mud as an adhesive to “glue” their nests to a vertical surface like the wall of a barn or a picnic shelter. Cavity Nesters—A number of birds prefer cavities—small openings in the sides of trees, cacti, or any other snug little openings they can find. 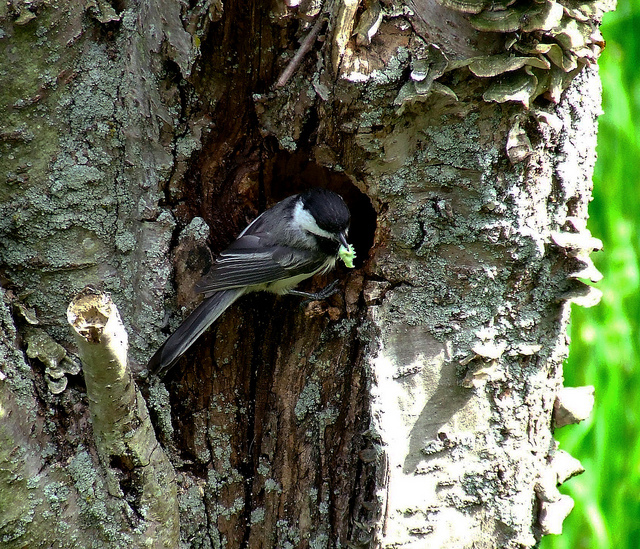 Birds like chickadees will find an abandoned cavity of some sort and line it with feathers and grasses to make a home for their brood. Pendant Nests—If you have ever seen what appears to be a slender woven bag hanging from a tree, you may have spotted an intricate pendant nest! These nests are almost like little baskets, carefully woven from grasses, hanging from tree branches. Orioles are an example of birds that create these kinds of nests. Scrape Nests—On a nature walk, we might not even automatically recognize these as nests. 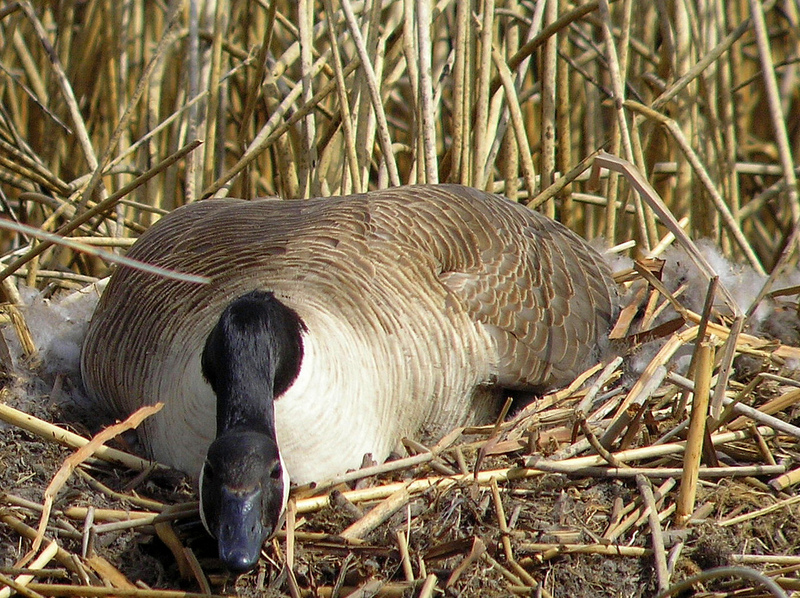 Scrape nests are generally little more than a slightly “scraped” out depression of ground to keep the eggs together. 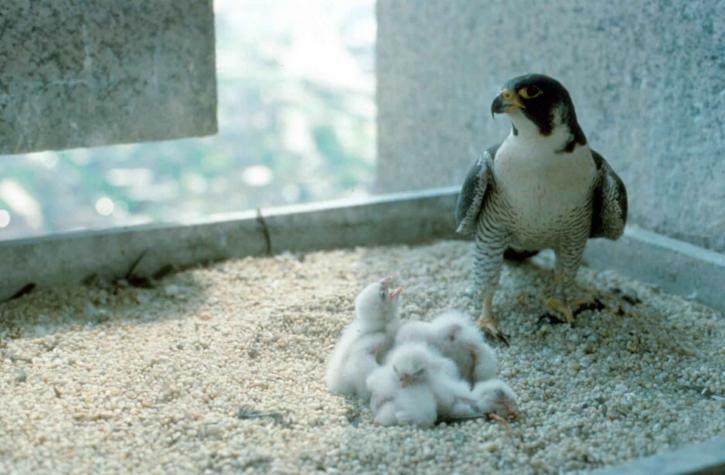 Our peregrine falcons are a good example of this type of nest. If you have watch the nest camera on the Cathedral of Learning, you may have noticed the general lack of nesting material in their gravelly space. Hope and Terzo created a little groove or depression big enough to the five eggs they are currently incubating, which is essentially the extent of their nest. In the absence of skyscrapers, though, they would create such a nest on the side of a cliff! Platform Nests—A nest that is relatively flat in appearance (as opposed to the rounding of a cupped nest), a platform nest can built on a branch, on a human-made object, or even in a wetland, with piles of leafy materials creating a little “platform” to keep the eggs and chicks out of the water. 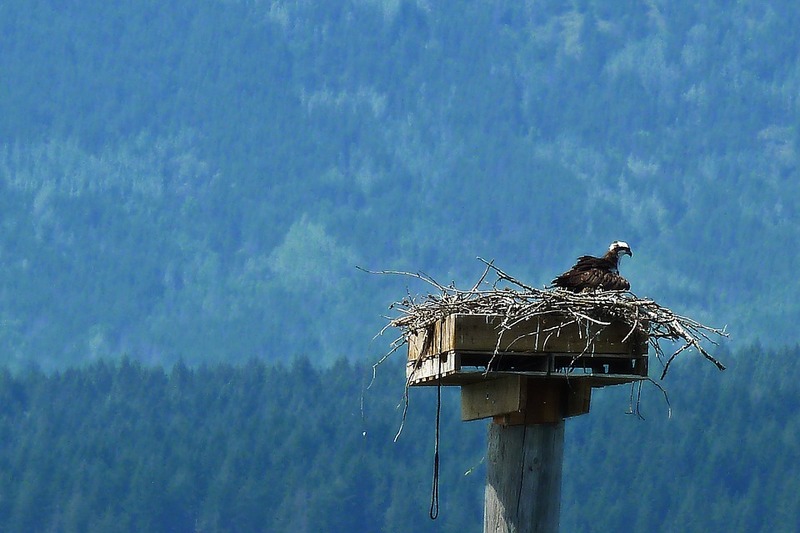 Osprey are an intriguing example of platform nesters. They also build their nests on literal platforms erected by humans around lakes and wetlands to provide homes for them. Ground Nests—These can resemble a cup nest on the ground or a large mound of mud. You may have encountered local notable ground nesters—Canada geese! – who aggressively defend their nesting spaces, commonly near a wetland or water source; but they may also commandeer flower pots, parking spaces, and little nooks near docks and boat launches. No Nest—Of course, then there are some birds who don’t even put together a scrape nest! Brown-headed cowbirds, for instance, lay their eggs in the nests of other birds (brood parasitism), and thus, don’t need to bother building a nest of their own. So the next time you are out on a walk in the woods, keep a look out for the wide variety of nests out there! Remember that nature doesn’t have strict definitions for things, and you may often see nests that either don’t appear to fit into a single category—just enjoy the diversity! Connecting to the Outdoors Tip: If you have an interest in both bird nests and citizen science, check out the Cornell Lab of Ornithology's project Nest Watch! You can help play an important role in bird conservation with just a few minutes on a day during nesting season! Photo Credits: Robins nest, Wikimedia user Laslovarga, CC-BY-SA-3.0; Chickadee, Flickr user Dave Bonta, CC-BY-SA-2.0; Peregrine falcon, USFWS, public domain; Osprey, Pixabay, CC0; Canada Goose nest, USFWS, CC0.